Welcome to the first Monday of Spring 2019! Or at least I think it’s spring. It’s still on the damp and chilly side here. But what better way to warm up than with new music from children’s performers who may be new to many of you? Let’s take a little tour and meet some of them. First up I’d like to introduce you to Gro-Town. 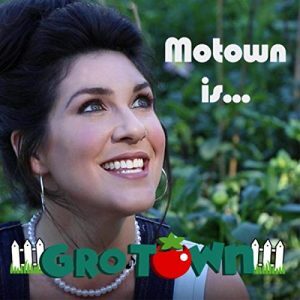 Danielle Carlomusto is a Detroit-based performer whose first album Motown is Gro-Town is filled with cute food and nature inspired songs that are perfect for this time of year. Each song clocks in around 1-1:30 mins., making them just right for storytime dance breaks. Covering everything from 1950s pop to kindie rock the entire album is enjoyable, with the polka-inspired “Pierogi” being an unexpected delight. Learn more at www.gro-town.com. 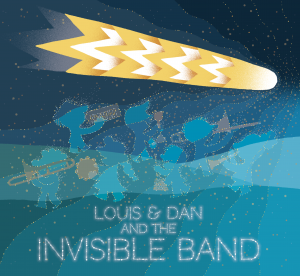 Moving now from the Motor City to southeastern Minnesota, here to entertain you is Louis and Dan & the Invisible Band. This duo of dads (who also happen to be professors) come to us from Northfield, MN. Their self-titled album crosses a variety of genres covering everything from rock n roll to country western. Topics vary from the clever imagining of what princesses do when they grow up to the very silly idea of underwear spaghetti. Grade school aged children will really enjoy the lyrical word play. Check Louis and Dan out at www.louisdaninvisibleband.com. Heading back to the eastern Midwest, we come to Columbus, OH, the home of Jordan Lynch & Friends. Their debut album is a collection of fourteen covers that range from the traditional (“Skip to My Lou,” “She’ll be Coming Round the Mountain”) to the pop of “Rainbow Connection” to the less familiar, “The Wild Mountain Thyme.” The album features a wealth of rich accompaniment that employs nearly two dozen different instruments. The songs are often comprised of an Americana feel that will appeal to fans of Red Yarn and The Okee Dokee Brothers. Created for a great cause, get more information at https://www.facebook.com/PiecesCD. And finally we stop by the studio to meet Sir Dapp & the Paw Prints. This fictional animated band includes Sir Dapp ( a silver-haired Schnauzer), his cousin Dollie, his nephew Duffie and their friend Grumpy Gertrude the goose. 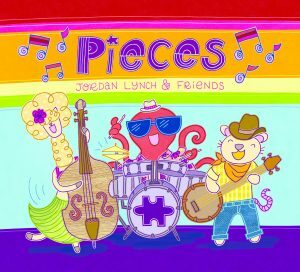 This album of catchy tunes about kindness and respect never veers into didactic territory thanks to the engaging lyrics that are brought to life by human artists Eli Jacobson and Rachel Potter. Each song is well produced and makes the album feel like it’s the cast recording of a stage show. Really enjoyable. 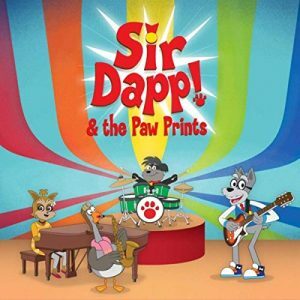 Meet Sir Dapp & the Paw Prints at sirdapp.com.